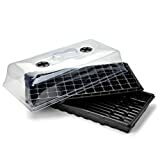 GrowJourney Note: Reusable, solid plastic trays are a must-have for seed starting, and these are the best we’ve found. 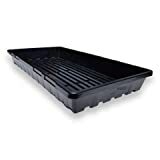 Made for and by real farmers at Bootstrap Farms, these trays are especially heavy-duty (which isn’t usually the case with seed starting trays), so they won’t fall apart while carrying your seedlings around and should easily last multiple growing seasons. 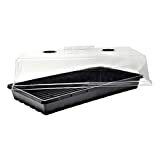 GrowJourney Note: Same great seed trays as the first product, but these include a 5″ high dome to help keep humidity high during germination. Once your seeds are germinated, remove the dome to help prevent “damping off,” a fungal disease caused by too much moisture and poor air circulation (commonly kills seedlings). GrowJourney Note: Want a one-and-done solution? This is it! This high quality 2-pack combo kit contains everything you need to start up to 144 seedlings at once! Made by Bootstrap Farmer out of North Carolina, these products are extra durable and long lasting so you’ll get years of use out of them. GrowJourney Note: Another great one-and-done solution with larger, individual cells so you don’t have to worry about “potting up” your seedling starts; you can keep your seedlings in the same cells from germination day to transplant day! High quality 2-pack combo kit contains everything you need to grow up to 64 seedlings at once! Made by Bootstrap Farmer out of North Carolina, these products are extra durable and long lasting so you’ll get years of use out of them. GrowJourney Note:These sturdy seed cells are heavy duty and designed to stay together as a single sheet; some gardeners prefer them versus the cells that come apart. Ultra-Durable, High-Quality, BPA Free 72 Cell Tray (with drain holes). Made to last multiple seasons, won’t break or crack while carrying plants. They fit the standard 1020 cell trays; cells are 1.5” square x 2” deep. Use with: Solid-bottom seed starting trays to avoid water leaks. GrowJourney Note: These sturdy seed cells are heavy duty and designed to stay together as a single sheet; some gardeners prefer them versus the cells that come apart. Ultra-Durable, High-Quality, BPA Free 128 Cell Tray (with drain holes). Made to last multiple seasons, won’t break or crack while carrying plants. They fit the standard 1020 cell trays; cells are 1” square x 1.25” deep. 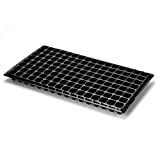 Use with: Solid-bottom seed starting trays to avoid water leaks, unless you buy a tray + flat pack (below). GrowJourney Note: Not reusable, but these biodegradable pots make seed starting and transplanting super simple. They also minimize root disturbance and transplant shock since you put the whole biodegradable pot straight into the ground when you transplant your seedlings. GrowJourney Note: If you want to go all-in and get the whole seed-starting kit for biodegradable cells. Biodegradable pots make seed starting and transplanting a breeze, minimizing root disturbance and transplant shock since you put the whole pot in the ground when you transplant your seedlings into your garden. 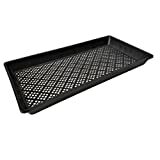 3 plastic planting trays w/ drainage holes. GrowJourney Note: The classic seed starting cells for seed germination. 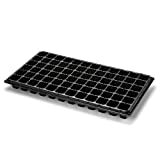 120 6-cell trays with thinner plastic designed so you can easily pop out individual seedlings. 720 cells will keep you growing for a long time to come. 720 cells, (will ship as 120, 6-celled trays). Equivalent to ten 1020 flats. GrowJourney Note: Label your seed cells AND transplants so you can remember what each seedling/plant is! So many new gardeners make the mistake of not doing this, and it causes all kinds of headaches. Write in plant type and variety (ex: Tomato, ‘Peacevine’) so you’ll know where to put it in your garden and whether you love it and want to grow it again once you’ve eaten it. Very easy to stick in and remove from soil. GrowJourney Note: These plant tags give you more room to write and make reading easier. You also don’t have to pull them out of the ground to read them, making them a great choice for the plant tags you use in your garden. Durable UV-resistant plastic that will last for many seasons. GrowJourney Note: If you are looking for nicer tags that will never fade or have the contents wear off (we use them to mark trees, special plant varieties or plants in public spaces, like a butterfly garden), these copper tags will do the trick. Permanently engrave the copper name plate using a ball point pen or these awesome letter stampers! GrowJourney Note: Spray bottles are essential for keeping your seeds in the ideal moisture range to germinate, especially if you’re using Ladbrooke soil blocks. After going through many “cheap” spray bottles, we bought one that would last. 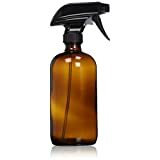 This spray bottle also works great when you’re spraying neem oil on your indoor seedlings to get rid of aphids. GrowJourney Note: Many of your favorite summer garden plants need temps of 75-80+ degrees to germinate, but your house is only around 70. 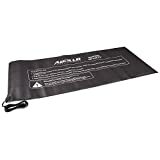 A heated seed propagation mat can make the difference between low-no germination and 100% germination by keeping temps 10-20°F over room temp. This one is sized to fit perfectly under a single seed tray. GrowJourney Note: Seedling mats regulate temperature 10-20°F degrees above the ambient air temps, but on their own they won’t stay at a specific temperature. Sometimes you need warmer conditions, which is where a thermostat comes in. 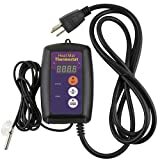 It will provide the constant optimum temperature you set it to, between 68-108°F / 20-42°C depending on your specific crop. 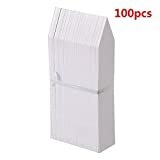 GrowJourney Note: Complete Ladbrooke blocker set for more advanced gardeners and people with large gardens who start a lot of seeds. Never buy seed cells again! You’ll get faster & more reliable germination with the micro blocks vs plastic cells), and you can start over 300 seedlings in a single tray, 4x more than with seed cells. Use with: Mesh bottom trays + Solid flats to press the blocks into. GrowJourney Note: Micro 20 is best for starting small seeds, then soil blocks with germinated seedlings insert inside Mini 4 soil blocks. Used extensively in Europe to start seeds – no more individual cell packs! You can start over 300 seedlings in a single tray, 4x more than with seed cells. Our favorite way to start nightshade seeds–in our experience you get faster & more reliable germination with the micro blocks vs plastic cells. GrowJourney Note: Most popular Ladbrooke soil blocker size. 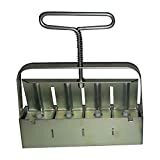 Makes four 2″ soil blocks. We sometimes start our larger seeds (like cucurbits, favas & beets) that don’t like having their roots disturbed in these blocks. These are also used to “block up” your mini-blocks so they have room to grow. We’ll usually wait about 2 weeks, but some people will do it as soon as 7-10 days after germination. 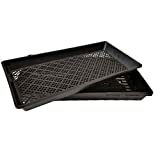 GrowJourney Note: If you’re using Ladbrooke soil blocks, you’ll need these trays as inserts inside your non-draining seed trays. They create an even flat surface for the soil blocks to rest on, and allow you to easily lift out all your blocks at once when you need to. 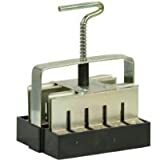 They also help keep your seed blocks properly drained and aerated. Use with: Solid-bottom seed starting trays to avoid water & soil spills. GrowJourney Note: Get this combo pack to help complete your soil blocker seed starting kit. Includes 5 trays + 5 mesh tray inserts. GrowJourney Note: Since regular seed starting mix won’t work in Ladbrooke soil blockers, you’ll need to either make your own custom mix or purchase one. We recommend buying this excellent organic soil block mix since it’s got the perfect ratio of ingredients, and even has worm castings to help inoculate your seedlings’ roots with beneficial microbes. GrowJourney Note: Do NOT use gardening soil for seed starting indoors in cells! The soil will quickly turn into a brick. 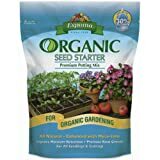 Instead, make your own mix OR use a high quality organic/OMRI listed seed starting mix like this one. We love all the beneficial microbes in this mix, which will make your seedlings & plants extra healthy. Premium blend of sphagnum peat moss, peat humus, and perlite. Enhanced with Myco-tone®, a proprietary blend of mycorrhizae fungi to supercharge the roots. 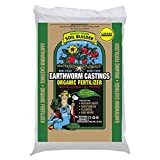 GrowJourney Note: Worm castings make an excellent amendment to any garden or seed starting mix. If you don’t have your own castings to add to the mix, we highly recommend you get these. They act like a ‘super humus’, an extremely fertile organic fertilizer properly conditioned for best root growth and most bio-available plant nutrition. These also make an awesome outdoor garden soil amendment or actively aerated compost tea (AACT). GrowJourney Note: If you’re making your own seed starting mix, you’ll need to use a sphagnum moss or coco coir in addition to organic materials (like worm castings & top soil), fertilizer, mycorrhizae and perlite/vermiculite (for aeration). 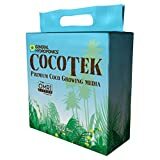 Coco coir is more sustainable than sphagnum peat moss (what’s commonly used) since it comes from a waste product (coconut shells/husks). Rapidly expands and holds water once wetted. We’ve been using this brand for years. GrowJourney Note: Beneficial soil microbes, including mycorrhizal fungi, make all the difference when you’re trying to grow healthy organic seedlings or mature plants. This is an excellent inoculant for your seedlings and mature plants alike. 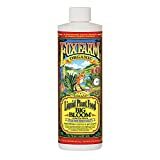 GrowJourney Note: This organic liquid fertilizer is great for giving young indoor seedlings a balanced fertility boost, but it also works equally well on any of your other mature indoor/outdoor plants as well, including perennial fruit, nut, and berry plants. GrowJourney Note: A key ingredient in our DIY seed starting mix, vermiculite (a heat-treated mineral) increases water & nutrient retention in seed starting mixes and potting soil. It can also be used as a soil amendment in sandy, nutrient-poor soils. 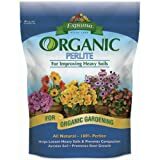 GrowJourney Note: Another key ingredient in our DIY seed starting mix, perlite is tiny pellets of volcanic glass (don’t worry it’s not sharp) that is used to increase soil aeration and drainage in seed starting mixes and potted plants. It’s also used an amendment to lighten heavy clay soils.